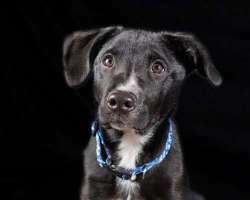 Ace is 4-5 months old, collie/lab mix he weighs about 25 lbs This young boy is currently all legs and ears. He plays hard and sleeps hard. He was an owner surrender, the man did not have enough time or energy for him so he gave him up. 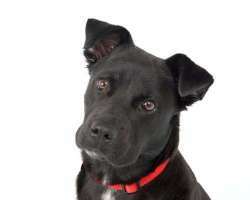 He is 100% house trained and will start to run around frantically when he needs out! He will use a dog door but likes to have a companion if out at night. He is strong minded so will need a strong person to help train him with his manners. He is not a chewer, sleeps in his crate all night and walks on leash. 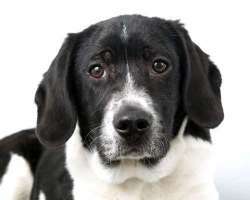 He would love another active dog in his home to match his energy. 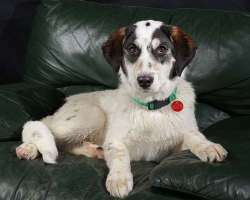 He is a beautiful boy and with consistant training and boundaries will bring much joy to his family. 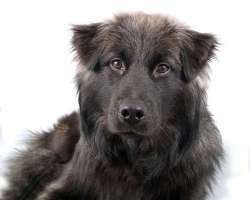 Alphonse, 1 year Male Keeshond/Retriever Mix Alphonse or Alphey for short is as intriguing as his name. His unusual coloring is eye-catching. But his mellow temperament and sweet disposition make him so special. He is still a young pup but very laid back. Alphey enjoys playing outside but when the family goes inside that is where he wants to be. We think he will do best with kids 9 and older. He is very quiet and not a barker at all. He walks well on a leash and is learning quickly not to pull. Great in the car, he falls asleep. In the crate, his foster home keeps a small fan on him because he gets uncomfortably warm but he sleeps through the night. He’s never lifted his leg or had one accident in the home. Alphonse is not a dog you would get for a companion for another dog because humans are his world. He gets along fine with other dogs but he wants to know where the family is. He also seems to be fine with cats, at least he is learning as he is very interested in them. He can be too much for an older dog though. He is also learning commands quickly. He is a stunning boy is waiting patiently for his forever family. Annabell and her sisters were born in a southern rescue and weren't getting adopted so they are still a little shy, but have come a long ways. They will be great family dogs. They have been on heart worm preventive all along. These pups like to play. They love other dogs, will chase a ball and will flourish in the right homes. We are requiring a physical fence for these girls as they still dont know who and what to trust so would be hard to find if they got loose. Bella is a petite beagle mix. She is 8-10 months and weighs 12 lbs. 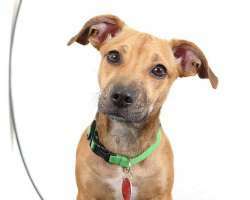 Bella is a cute little girl that was rescued from a TN animal shelter. She is soft and cuddly but yet she likes to run and play. She is getting along famously with all sizes of dogs at her foster home, even dealing with four puppies. She patiently waits hoping they will get bored and leave her alone. She has not paid any attention to the house cats. Beagles are usually tolerant. She is doing great with house training. She runs out with all the dogs and everyone does their business. She is crate trained. We think kids aged 5 and older best for her. 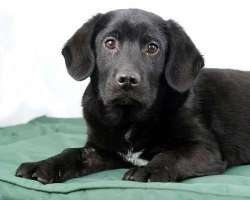 Bitzy is a small/medium sized female mixed breed Pug/Lab who weighs about 38 lbs. She is 1 year old, and is spayed, and housebroken. She loves to play and loves all the other foster dogs. She fit right in about 30 sec. after she arrived in foster. She was the shelter manager's favorite and got to hang out in the shelter office all day. She is crate trained and walks nicely on leash and rides nicely in the car. She loves people and attention but is not in your face all the time. Please fill out an online application if interested in meet her. Boomer is a GORGEOUS young dog -- pictures do not do him justice. He is approximately 8-10 months old and seems to be a small husky mix. He weighs 40-45 lbs. Boomer is absolutely beautiful, he has one blue eye and is the more unique red coloring. His coat is so thick and soft you just want to pet him all the time. He was rescued from a TN animal shelter, but was definitely not a street dog. He loves people and really loves riding in the car. He jumps right in and sits down and looks at you as if he is hoping for some great adventure. Everyone who meets him loves him. Husky dogs are beautiful, but do have exercise needs. He needs a secure fence as he is very athletic. A large yard would meet his exercise needs. This is not a dog to put on a runner. This is a working breed and their energy needs must be met. They are extremely intelligent and very loving and loyal. Available 3/29. Please fill out an application if you are interested in meeting him. Then come meet him at our shelter Sat and Sun. We're open from 12-3 PM. Brandy is a very cute and playful puppy. She is well behaved in her kennel and holds it through the night. She loves dogs and people alike. She looks so dignified in her pictures, but she is very much a pup, just a well behaved one. 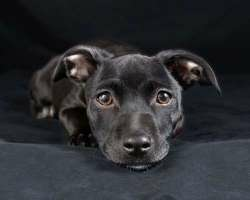 Her story is so typical of many rescued dogs. She was found laying beside a road very weak and emaciated. She had a severely infected wound on her leg. She is great now and is all healed. She is rather calm for a pup of 9 months. Brandy loves to play with other dogs and the kitten in her foster home. She is so gentle with the kitten as if she really does know that the kitten is fragile. Brandy will go into her crate especially if there is a treat involved. She is working on crate training and house training but does let you know when she needs out when in the crate. She loves her toys and she is not a destructive chewer. Brandy is doing well on a leash and will sit for a treat. She just loves to be with people but is not a shadow. She can and will entertain herself and she can be quite comical. Brandy is good on car rides also. 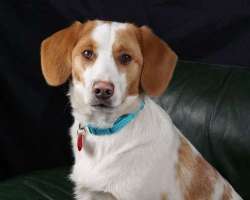 Cheri is a beautifully elegant Hound mix. She is housebroken, crate trained, cat tested, and good with kids. She's spayed and up to date with her vaccines and just loves everybody. She plays hard and crashes hard. She adores to spend time with her person and snuggle....a big lap dog! She has learned 'sit, 'stay' and 'off'. Cheri loves the outdoors and thinks she is a retriever and will bring you the ball to keep tossing for her. She is an awesome dog and very affectionate. 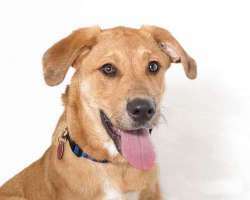 Chloe, 7-8 Months Female Great Pyrenees Mix Chloe has always been with other dogs and was adopted briefly to a working woman and showed some separation anxiety. She is still learning crate training and if she gets enough exercise she will happily go in for a nap or bedtime. Her foster family is working on leaving her alone but we believe she would do best in a household with another dog. Chloe was abandoned on a back road in TN and found her way to a nice person who got her into rescue. She is absolutely a delight to be around. Her laid back temperament makes her a good candidate for a great family dog. She enjoys being outside (loves the snow) so a safe fence is important. She is a puppy so needs basic obedience and is learning not to jump. She is still a chewer so soft toys are not the best right now but is easily redirected to appropriate things. Chloe is still a youngster and really wants human companionship. She gets along with other non-aggressive dogs and seems fine with cats. She walks perfectly on the leash and is learning not to dart at squirrels and not to go in the street. She’s great with children. 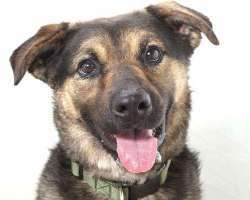 This gentle beauty has a lot of love she has been saving for just the right family. She is house trained so will ask to go out. She is being spayed 3/12 but will be available to meet today at our meet and greet 12-3. We'd like her to go with another dog. 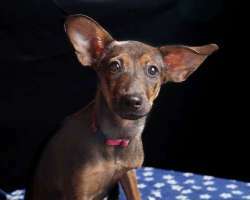 Christina is an adorable 3 month old Island pup from St. Thomas. These pups tend to be on the smaller side, are somewhat Labby / Boxer looking, but they are a blend of many breeds. They are sweet pups who are up to date on vaccines, but too young to spay. 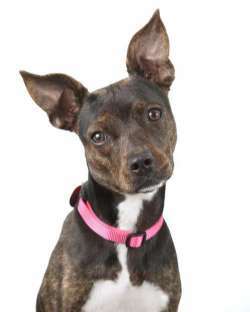 She is inquisitive and loves to play with other dogs. She is fostered with kids and another dog and is fine. she is learning to love the crate but will sleep through the night. she does give signals to go outside to do her business so is almost house trained. Christina is good on a leash and rides well in the car. If you would like to meet her please come to our next Meet and Greet Saturday 12-3. 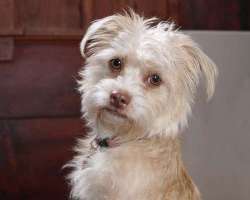 Duchess is a one year old Cairn / Border Terrier mix who came into rescue in TN. Her owner gave her up. She has mild energy, needs house training, but is crate trained. She would do well with a part time worker who would crate her part of the day. She came in with Maverick from the same home so would be fine with another male dog at least. She was also fostered with the Spaniel/Beagle pups and played with them. 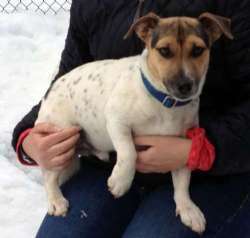 She is available 3/1 and will be at Petco Natick from 12-2 PM. Emily is a spectacularly cute puppy! 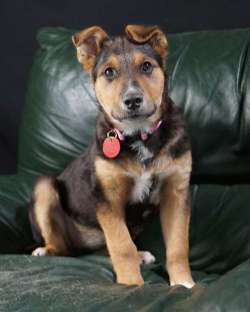 Her breed has us puzzled but looks like a mini GSD. Whatever her mix it is completely adorable. Emily is around 10-12 lbs and may just stay small. Emily was rescued from a TN animal shelter and landed safely at one of our southern fosters home. She is quite a little bundle of cuteness. Her personality is wonderful. She has done very well learning to love the crate. She is still young enough not to be able to make it through the night. She is having a wonderful time following all the big dogs she wants to play with them. She does go for a walk everyday and is leash trained. Her foster mom says: A little update on Emily. She is 100 % housebroken with a dog door. She is very friendly towards people and other dogs. Loves to run and play. In the crate she is very quiet and well behaved. She is a very mellow and well behaved puppy. She will follow you around and lie down in any room you are in and watch you! 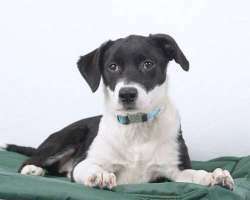 Emma is an adorable 3 month old Island pup from St. Thomas. These pups tend to be on the smaller side, are somewhat Labby / Boxer looking, but they are a blend of many breeds. They are sweet pups who are up to date on vaccines, but too young to spay. Please read up on our holistic protocol and come meet her during our shelter hours. 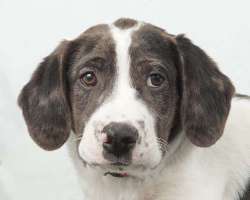 Farley is a good boy looking for a nice loving home. He's got a lot of Shepherd in him and the shape of his head and overall size/shape is shorter. He is two years old and he gets along with other dogs and cats. He loves his ears rubbed and would love to have a place to call his own with room to play. He knows Sit and will give Paw. He is a calm dog, nice energy. He likes to cuddle and gets along great with kids and adults. He is medium energy. He has a broken toe that we are treating with antibiotics as well as homeopathically. He is available after 3/24. If you live in the Natick or Walpole area we'd like him to have the cold laser therapy and to stay on the homeopathic remedy. He's a young dog and this is a minor issue that doesn't bother him at all. 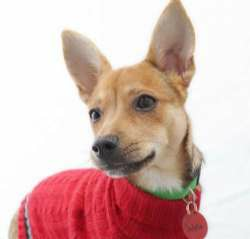 Felicity is an adorable female small (6 lbs) mixed breed who looks like another pup we have, named Zip. She is beyond cute and also very sweet in personality. 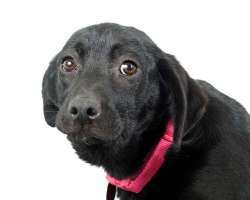 She was rescued in St. Thomas and is flying here for a chance at adoption. Her rescuer writes: "Felicity was dropped at shelter 12/4. I was told she was one of six litter mates. When we took her to the vet to get spayed on Wednesday they said she was 11 lbs. Rhea said she would be about 25 lbs. Of all the litter mates, she was the smallest. I walked only the girl litter mates. As well, of all the litter mates, she was docile, (she did exhibit puppy energy but she is in a small cage most hours of the day). She also exhibited submissive but social behavior when playing with her other mates. She is undoubtedly a very very happy and sweet girl." Available 3/1/14. 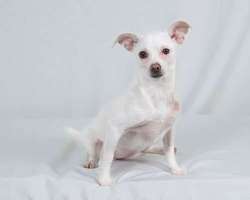 Florie is super friendly with all the other dogs, and loves to snuggle up next to them, or even in my lap. She already learned how to climb up and down all the stairs – so she cannot be left unsupervised. She has a voracious appetite. She plays with the stuffed toys and bones. She is still very young, so she still plays hard, then sleeps for a while. She is still learning to love the crate. She is learning leash training and house training. She will need someone home durring the day while she learns her puppy lessons. The car is a new thing for her and she is geting better if she can see out of her crate. 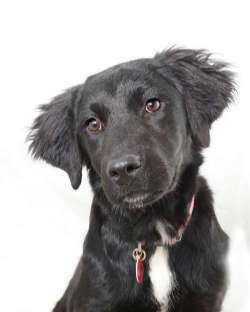 Florie will be at Petco in Natick Saturday 3/22 12pm-2pm. 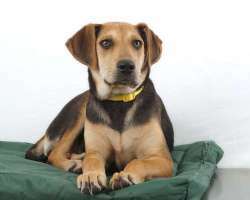 Halo is a beautiful hound mix. She is about 35 lbs and 6 months old. Halo is a young dog that was rescued from a TN animal shelter. She has done very well on house training with a dog door. She walks well on leash and is good with the cats in her foster home. She is not a chewer but is young so still needs supervision. She get along well with all sized dogs. Halo has worked very hard on crate training and is now sleeping through the night. She is very good in the house; she plays all day with her dog friends and passes out at night. Izabella looks like her sister, Miya, shown right, but Izabella has more freckles. She and her sisters were born in a southern rescue and weren't getting adopted so they are still a little shy, but have come a long ways and will blossom in their homes. They tend to ignore cats. They will be great family dogs. They are spayed and have been on heart worm preventive all along. These pups like to play. They love other dogs, will chase a ball and will flourish in the right homes. We are requiring a physical fence for these girls as they still dont know who and what to trust so would be hard to find if they got loose. 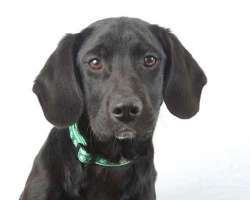 Jerry is a Great Dane / Lab mix. He is only 5-6 months and already weighs 40 lbs. His feet look like Dane and our vet thought so too. This big baby loves his belly rubbed and will flop on his back to encourage you! He really just stole the rescue woman's heart in a TN shelter. We observed Jerry meet a family with kids and he became very calm as the children approached him. They petted him all over and he loved all the love he got. It was like he knew to be gentle around the children. Still we wouldnt advise little ones as he's going to be a big, goofy pup for another year or two. Tweens or teens would be great as he needs someone to play with. Another dog would be awesome. 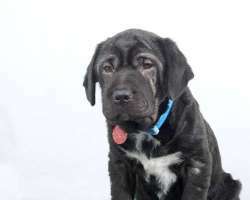 He will need training as he is going to be large and does not have all his manners in check.He has a heart of gold and is just a big friendly pup, but get a leg up on the training before he gets too big. Jewel is 1-2 years old and she weighs about 35 lbs. This little beauty was picked up by animal control in TN. She was a stray but likely had a loving owner at some point because she loves human companionship. Jewel is quiet and calm. She likes her own space and person but does get along with other dogs that don't respect her space. She does best with calmer or older dogs. She would love to be an only dog to have all her person's attention. She is almost house trained; she's working on how to tell us. Confined spaces are worrisome for her right now but with time and gentle encouragement she will be fine. She walks on her leash but could use a little polish which will come with experience. Josie is a 6 month old puppy who was rescued in St. Thomas and brought to Save A Dog by a kind traveler. She is such a lovely puppy and so very smart. She is very playful and fun loving. She will chase a ball or sit by your feet and chew on a bone. She is a delight! She needs a wonderful adopter who will commit to her for her entire life. Please follow our holistic protocol and feed highly nutritious food, provide supplements, and minimize vaccines and you will have a healthy pup. Please apply online if you would like to speed the process. 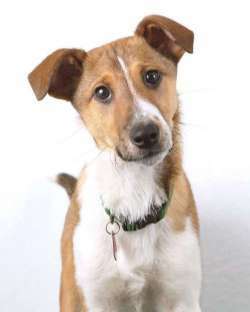 We are showing her during our Meet and Greet hours at Petco on Saturday (Natick) from 12-2 PM. 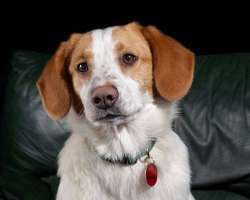 Maverick is a two year old male who looks a lot like a Petit Basson Griffon Vendeen (PBGV), but his ears are shorter. 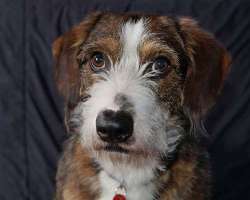 He is a mix of something that is terrier-like with a Basset shape but not as heavy. He's a sweet, calm boy for 2. He and Duchess were from the same owner and both love everyone they meet. He would be fine living with a female dog and doesn't seem to have any issues at all. He has a gentle nature and doesn't jump up (as least not that we have seen). PERSONALITY PLUS! Forget the fact that she's a Chihuahua and that there are so many Chi's for adoption. Mazy has the personality of a Golden Retriever. She's officially become the Social Director at the shelter, greeting everyone with a whole body tail wag, both dogs and humans. 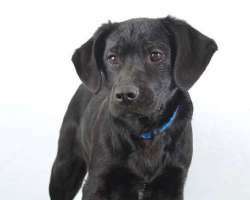 Mazy could be a backup for adopters that were interested in Brody a couple weeks back. 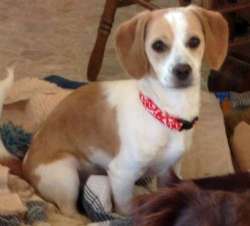 Mazy is a 7-9 months old, she is under 10 lbs spayed and looking for her new family. She can play with all sizes of dogs, large and small, and is great with cats too! What a little bundle of joy! She would be great with kids as well. This little cutie ended up in a shelter in TN. She small but is a little fire cracker and can hold her own while playing with other dogs. She is all white, and very pretty, but if you're looking for a purse dog, mazy is not your dog, she's more the tomboy girl. She is house trained, also pays no attention to cats, she just doesn't have time for them. She has too much to do, making everyone smile. She snuggles up on her dog bed in the evening. She is working on loving the crate, and loves car rides. She gets along with all the other dogs in the foster home, big and small. She will always greet you with happy tail wagging. Miya looks like her sister, Izabella, but Izzy has more freckles. She and her sisters were born in a southern rescue and weren't getting adopted so they are still a little shy, but have come a long ways and will blossom in their homes. They tend to ignore cats. They will be great family dogs. They are spayed and have been on heart worm preventive all along. These pups like to play. They love other dogs, will chase a ball and will flourish in the right homes. ABOUT RUSTY (18MO, 15LB) Rusty is a great little boy. He gets along with other dogs and likes kids too. He was taken into a home close to where he had been dumped and a very nice lady took him in while it was below zero. She called to see if we could help find him a loving home. She said he does not chew on anything other than toys and he does well in the car. He sleeps in a crate at night and stays in it when you go out. He is a very loving little guy. He warms up quickly and likes to be held. He is available after 2/24/14. Please apply on our Web site to speed the process. Sable is an adorable little girl from St. Thomas. She is precious with her big fox-like ears! She is still a baby so will need someone home with her for the next months to learn her puppy lessons of crate training and house training. She is up to date on shots and looking for someone who will use our holistic protocol to keep her healthy. You can read about it on our web site and also learn about our process. Please apply at www.saveadog.org. Shiloh is a beautiful sweet little girl who was found on the side of the road in Tennessee. She is 3-4 mo. old about 20lbs. She is housebroken and crate trained. She rides well in the car and is great on a leash. She is good with kids and cats. Has learned some commands for sit, lay down and stay. 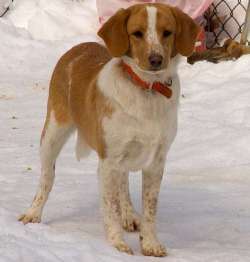 Shiloh loves to play outdoors and plays very hard and then will come in and want time with her people. She loves to be with people and is very affectionate. A great dog. These puppies were brought into a TN shelter when their owner died. These puppies were brought into a TN shelter when their owner died. They all had demodectic mange and kennel cough, from which they have recovered. They are likely from several litters but our group rescued them all from a TN shelter to save their lives. . There are 7 males and 1 female. 2 males are black and white, others are all black. They are sweet and gentle puppies. They are all house broken with doggie door. They are learning about the crate and will explore it during the day. They will fall asleep on car rides. They have taken a couple trips to Petco and the park . They love people and other dogs. They will wrestle and play all day and come inside for naps on the dog bed and then head outside to do it all over again. These puppies were brought into a TN shelter when their owner died. These puppies were brought into a TN shelter when their owner died. They all had demodectic mange and kennel cough, from which they have recovered. They are likely from several litters but our group rescued them all from a TN shelter to save their lives. . There are 7 males and 1 female. 2 males are black and white, others are all black. They are sweet and gentle puppies. They are all house broken with doggie door. They are learning about the crate and will explore it during the day. They will fall asleep on car rides. They have taken a couple trips to Petco and the park . They love people and other dogs. They will wrestle and play all day and come inside for naps on the dog bed and then head outside to do it all over again. Theo is neutered. Tigger is from a different litter and we think has some Shar Pei in him. He is the smallest of the whole group. He is also the youngest at 15 weeks. These puppies were brought into a TN shelter when their owner died. They all had demodectic mange and kennel cough, from which they have recovered. They are likely from several litters but our group rescued them all from a TN shelter to save their lives. . There are 7 males and 1 female. 2 males are black and white, others are all black. They are sweet and gentle puppies. They are all house broken with doggie door. They are learning about the crate and will explore it during the day. They will fall asleep on car rides. They have taken a couple trips to Petco and the park . They love people and other dogs. They will wrestle and play all day and come inside for naps on the dog bed and then head outside to do it all over again. These puppies were brought into a TN shelter when their owner died. These puppies were brought into a TN shelter when their owner died. They all had demodectic mange and kennel cough, from which they have recovered. They are likely from several litters but our group rescued them all from a TN shelter to save their lives. . There are 7 males and 1 female. 2 males are black and white, others are all black. They are sweet and gentle puppies. They are all house broken with doggie door. They are learning about the crate and will explore it during the day. They will fall asleep on car rides. They have taken a couple trips to Petco and the park . They love people and other dogs. They will wrestle and play all day and come inside for naps on the dog bed and then head outside to do it all over again. Trey is already neutered. 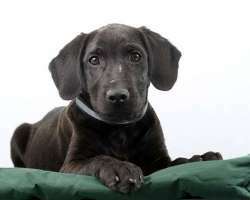 Tucker is a little male Lab mix pup who has a tiny white stripe on his nose. He is otherwise all black with a thick Labby coat. He's a nice pup who poses for his pictures. These puppies were brought into a TN shelter when their owner died. They are likely from several litters but our rescue group rescued them all from a TN shelter to save their lives. They are black lab mixes about 22 lbs. There are 7 males and 1 female. 2 males are black and white, others are all black. They are sweet and gentle puppies. They are all house broken with doggie door. They are learning about the crate and will explore it during the day. They will fall asleep on car rides. They have taken a couple trips to Petco and the park . They love people and other dogs. They will wrestle and play all day and come inside for naps on the dog bed and then head outside to do it all over again. Violet, 1 year Boston Terrier Mix Violet wants to play and roughhouse and run like the wind. But this sweet girl is a lap dog at heart. She would be great with a family with older children or an active person. She is completely housebroken and loves car rides. She knows how to sit and is learning not to pull on the leash. She has a vivacious enthusiasm to discover what’s new and different around the corner. She is no “shrinking violet” and seems to befriend all people and animals (cats included). She gives everyone a sweet, friendly sniff and is immediately accepting. She would do well with an evenly matched dog in the household and makes an excellent candidate for dog parks. Violet sat in the TN shelter for several months, which is baffling to her foster family they think she is a very special girl. Plus her white socks, brindle coloring and stand-up ears certainly get her noticed. 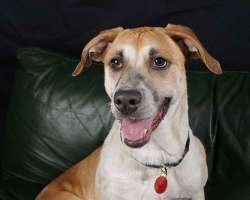 Please apply at www.saveadog.org if you are interested in meeting her. She is available after 3/20. WALLY HAD SO MANY APPLICATIONS TODAY. WE APOLOGIZE IF YOU WEREN'T SELECTED FOR HIM. HE DID FIND A WONDERFUL HOME! Wally is a 3 months and about 10-12 lbs. He is a very cool little guy; he has stolen the fosters heart as he likes to snuggle with his little head on her shoulder. But don't think he's just a pretty face; he is super smart and learns fast. He was house trained and crate trained in 1 day. He quickly learned to leave the big scary foster cat alone too. He loves to play with all dogs. He is working on leash training and doing great. He was rescued from a TN animal shelter. He has bright alert eyes that don't miss a thing. Watch out he will steal your heart. BEYOND CUTE is the best way to describe this 20 lb. Beagle boy. 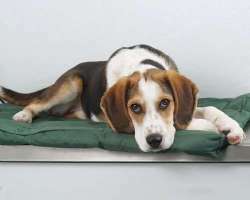 Willy is a very cute and petite and sweet Beagle boy. He loves to cuddle. He likes kids and other dogs. He is house trained and likes to sleep on the dog bed. He only barks when he is excited but is generally a quiet Beagle. 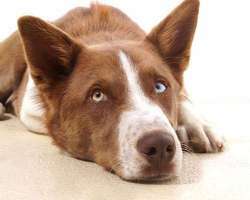 He is very submissive to other dogs and although food motivated, he is not food aggressive. Willy would make a great companion and friend for your family. He is in a foster home right now. He would be happiest with a fenced in yard where he can sniff to his heart's delight. It's not a requirement for adult homes, but with children it's a must. What a sweet dog. He's not destructive, loves pets, and although he follows his nose, he knows his name and comes when called. He is available by appointment only as he is in a foster home. Please fill out an online application to speed the process. 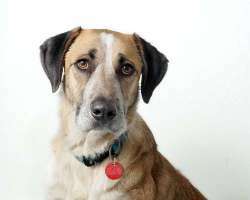 Wyatt is an Anatolian Shepherd mix, who weighs 55 lbs and is 2 years old. Meet Wyatt, he's a quiet boy and is very well behaved. Wyatt is a very laid back kind of guy and is happy just to lay on a warm soft dog bed and keep you company. He likes to play and run with other dogs, but would be fine as an only dog. He knows his basic commands and has lived with cats as well. He has big sad eyes even when he's happy. Wyatt loves to play fetch with balls. He loves going for walks and rides happily in cars. You will love this handsome mellow boy. He is best in a home as an only dog as he wants all the attention and doesn't like to share his food with other dogs. Available now. 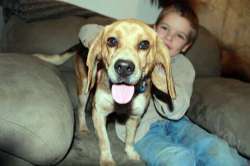 Save A Dog is at 604 Boston Post Road, Sudbury, MA.